After Morgoth killed Finwë and stole the Silmarils, Fëanor and his seven sons took an oath, by which they swore to Ilúvatar, in the presence of Manwë and Varda, that they wished the Everlasting Darkness upon themselves if they should fail to pursue anyone who stole or kept from them a Silmaril. Driven by his oath, Fëanor led the Noldor out of Aman and back into Middle-earth in pursuit of the Dark Lord Morgoth, who at the time held all three of the Silmarils. 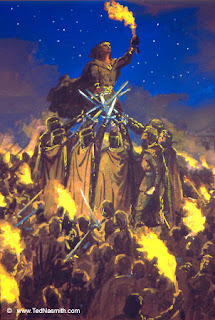 Though Fëanor was mortally wounded, the Sons of Fëanor continued to fulfill the oath. During this time, they united with the Elves of Beleriand against one common enemy. However, when Beren and Lúthien recovered one of the three Silmarils from Morgoth’s crown and brought it back to King Thingol in Beleriand, the doom of the oath became apparent. The Sons of Fëanor waged war with the Elves of Beleriand when Thingol refused to hand over the jewel; they attacked and destroyed Doriath, killing Dior, Thingol’s heir and invoking the second Kin-Slaying. Dior’s daughter, Elwing, took the Silmaril to the Mouth of Sirion; again the Sons of Fëanor attacked, committing the third (and most terrible) Kin-Slaying, and again, they failed to reclaim the jewel, which Elwing and her husband Eärendil the Mariner had brought back to the West. Following the War of Wrath, only two Sons remained: Maedhros and Maglor, who stole the two remaining Silmarils from the camp of the victorious west. 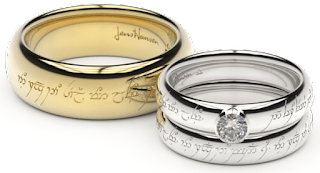 Yet the two brothers had committed so many terrible deeds in seeking retrieval of the Silmarils that they found they could no longer touch the jewels without enduring searing pain. The brothers parted; Maedhros thrust himself and his Silmaril into the depths of the Earth, and Maglor, now the last of the oath-takers, cast his jewel into the ocean, and was left to wander the shores of the world in lamentation. Foster, R. (2001). Oath of Fëanor. In The complete guide to middle-earth: from the hobbit through the lord of the rings and beyond. New York: Del Rey. Tolkien, J. (1977). The Silmarillion. Christopher Tolkien (Ed.). New York: Ballantine Books. Tolkien, J. (1985). The lays of Beleriand. Christopher Tolkien (Ed.). Allen and Unwin.